I make an effort to be intentional. On a good day, I’m just doing my best to get by. On a bad day, I’m an amalgamation of my bad habits in the worst possible way. I have a lot of bad habits that have become second nature — nail biting to quell anxiety, using junk food as a crutch in stressful situations, sleeping in instead of going to the gym, and procrastinating so I don’t have to start grading the stack of papers that will, in all honesty, probably only take a good 2-4 hours to grade. And giving in to these habits makes it really hard to be intentional. Ideally, I would wake up in the morning, chug some water, write in my journal, and then get myself to the gym. I would do cardio and yoga or weights, and then I’d come home and do some grading before I had to be in my office. I set my class schedule to make this easier. The earliest I teach is 1:30 PM. The earliest I have to be at the office is 11:00 AM. My mornings should be spent in a fit of productivity. But that’s rarely the case. There is always an excuse to sleep in. There’s always an excuse to stay home from the gym. There’s always something else to do besides grading. And there will always be a million other things that I’d rather do. And if I don’t think about it, I will always give into these things. One of the things I’m really great at is making action plans. I love designing schedules and projects and setting everything up. Where I screw up is the execution. 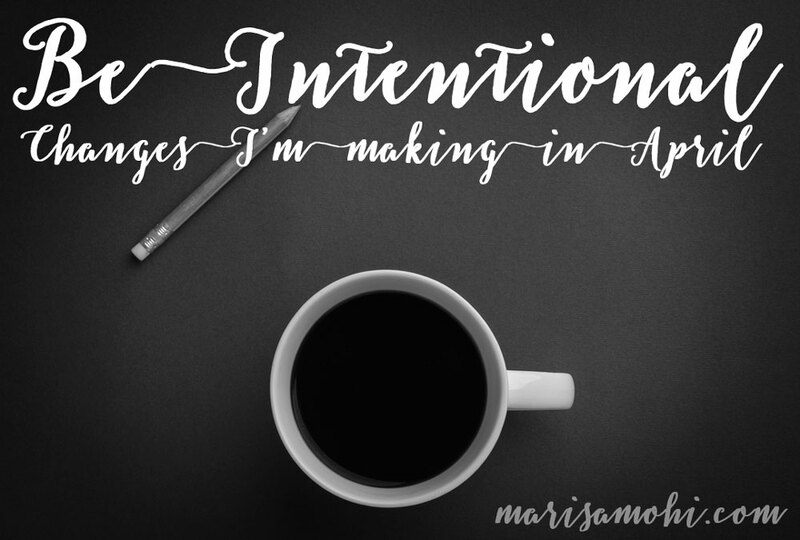 I love that I can be intentional just by making lists or plans. Sure, it’s one thing to create an entire spreadsheet of the workout plan you want to accomplish over the next three months, but it’s entirely another to get out of bed at 5:30 every morning and make sure you get that workout in. It’s one thing to plan out your evenings for maximum efficiency, but it’s entirely another to tell your friends that you can’t meet them for dinner because you really need to crush it this week. I know where I fail. It’s the same place every time. I just want to indulge. I’m like one of those lab rats that hits the pleasure button until they die. (Do you know what I’m talking about? Is this a well-known modern parable? I think it is, but sometimes I reference things and then everyone looks at me like I’m crazy, which isn’t far off.) It feels like every single day has become an opportunity for indulgence, and my self-discipline isn’t that strong. And when that’s the case, it’s hard to be intentional. Hell. It’s hard to just get the bare minimum done. I’m not talking lavish dinners and champagne brunches here. What I’m talking about is all the little first world comforts that we, as first world consumers, feel we are entitled to. I deserve this ice cream because it’s been a stressful week. I deserve this second glass of wine because I really need to relax. I deserve to buy this $50 eye shadow palette because it will help me look more professional at my day job. I deserve to sleep in because I stayed up a little later than usual. Even though I want to be intentional, I tend to make a lot of excuses for indulgent behaviors. I don’t deserve ice cream. I don’t deserve that second glass of wine. I don’t deserve a $50 eye shadow palette. I don’t deserve to sleep in. These are all things I want, and I justify it by using language that makes it seem okay. We all do this. We want so badly to give in to things. And that’s completely human. But look at how often you give in. Did someone leave cookies in the break room? (This is the bane of my existence.) When you went in there to heat up your healthy lunch, did you scarf three Oreos before the microwave dinged? Did CVS have a sale on your favorite candy, and it would’ve been silly to not buy it while you were there for some Claritin? Did you stay up an hour past your bed time binge watching Netflix, so naturally you can’t wake up on time? Perhaps you are a model of self-control and never give in when it comes to things like this. Perhaps it’s not hard for you to be intentional. I commend you. But if you’re like me, you catch yourself giving in, so much so that it’s second nature to just give in, and you don’t want to think about it at the end of the day because when you do, you really start to hate yourself. That’s where I am right now. I feel behind, I feel unhealthy, and I feel out of control of my own life. I want to stop procrastinating, because I hate having to get everything done at the last minute. I want to feel healthy, because I know I’m a better person mentally and emotionally when I eat right and exercise. And I want to feel in control of my own life, not just a person who gives in to bad habits all day. I really just want to be intentional. That’s what this April is going to be about for me. I needed to hit the reset button, and I hope that 30 days of intentional behavior will do wonders for resetting habits. I want to make a plan and stick to it. I don’t want to spend time thinking about where I got derailed. I don’t want to use my sliding scale of justification. I want to see some sort of result. 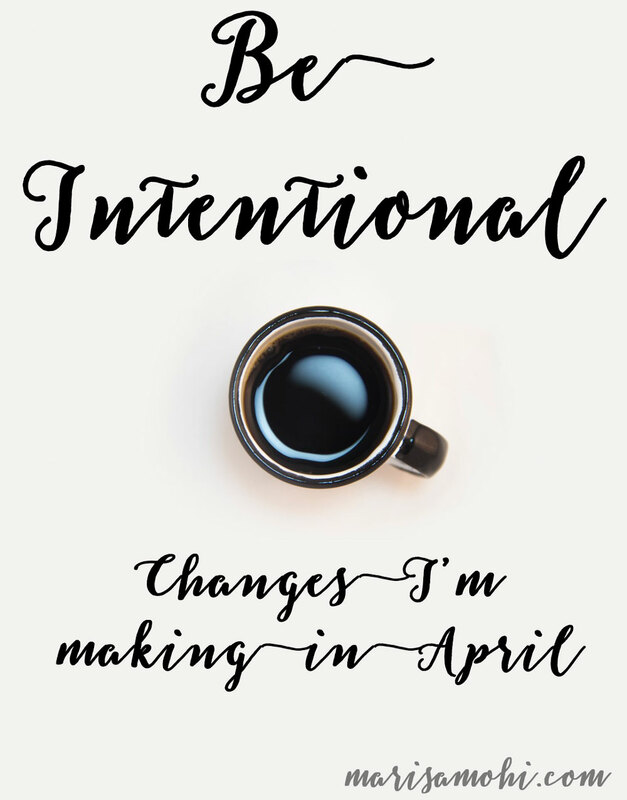 Here’s what I’ll be doing through the entire month of April to reset bad habits, be intentional, and keep me from giving in to my indulgent side. I’m not much of a binge drinker, though I was when I was in college and grad school, as were the majority of my classmates. Now, when I drink, I generally have one or two beverages and call it a night. But I know that if I even have just one, I won’t want to get to the gym the next morning. And if I have wine, I will be too dehydrated to get to the gym the next morning. (Seriously, we’re talking charlie horses the size of Texas in my calves.) I’ve also come to realize that I use alcohol as a crutch in social situations, because my introvert nature would rather gargle broken glass than have to spend time engaging in conversation with more than one person at a time. This April, I will avoid alcohol. For 30 days, I will drink water and black coffee, which, if we’re being honest, are my two favorite beverages anyway. And I will probably get back on the green tea wagon, because I have very productive afternoons when I consume it instead of Diet Coke. I won’t have a beer just because other people are drinking, and I definitely won’t be able to use “having a beer” as an excuse to eat pizza. And I think it’s worth mentioning here that I’ve recently met two women that I really respect who told me they don’t drink anymore, and that it’s made a huge difference in their lives. It may be time to bring back the “straight edge” Marisa I used to be about 11 years ago. I’m giving up spontaneous spending. I have a real bad habit of impulse buying. It can be as harmless as picking up a tube of chapstick as I stand in the check out line, or it can be as bad as “I bet this obscure product listed on Amazon is totally worth it” and before you know it, I’ve got a new thing that cost money and takes up space in my home. I’m done with that. So I will not allow myself to purchase unnecessary things. And I won’t go places where the impulse to buy is too strong. I have a lot of really healthy intentions. I meal plan most weeks, and pre-pack my lunches for the week. I will even have breakfasts ready and waiting for me in the morning. Dinners are usually something that we can just whip up really quickly if we’ve planned enough. But here’s the thing: I’m incredibly lazy. And it’s so easy to opt for junk if you’re even slightly tired. The Order Up app has become my arch nemesis. It’s so easy to just scroll through, pick a place you want to eat, and then have it delivered. You can pretty much just get in your PJs the minute you get home from work, and wait for someone else to bring you food. And if you’ve got some candy in your bag or desk, it’s just easier to eat that than it is to take your lunch into the break room and heat it up. And if you don’t really feel like eating the salad you made, it’s just so easy to give in by getting a burger and fries or a pizza. I’m done with all that. I’m tired of wasting groceries I don’t eat, and I’m tired of wasting money on food that is probably giving me diabetes and is definitely giving me heartburn. So, sorry if you invite me out this month. I will either say no, or be one of those really annoying people who packs food for themselves. I’m giving up staying up late and sleeping in. I love crawling into bed at night, but I hate getting up. I used to be able to just pop right up, but it’s been really hard lately. This is largely due to a combination of things. I think if I eat better, I will feel healthier overall, and be more rested when I sleep. I also know that I just have to make myself get up until my body is in the habit of doing it. Ideally, I need to be at the gym by 6:15 AM. On Mondays and Wednesdays I need to do 30 minutes of cardio before I do 45 minutes of yoga. On Tuesdays and Thursdays, I need to do 20-30 minutes of weights, and then 30 minutes of cardio. And I need to get up early to do all this, so that I still have time in the morning to do some paper grading and lesson planning. And hell, maybe even writing if by some weird stroke of luck there happens to be time for that. But if I get up and get to the gym, then I feel like I’ve accomplished something before 8 AM. That’s important. That sense of accomplishment can carry me through the day. And even on days when I don’t go to the gym, I need to continue to get up early, because there are little things I can accomplish in the morning that will give me the same feeling. So no more sleeping in, and no more staying up way too late. I need to be in bed by 10 PM at the latest, and out of bed by 5:15 AM so that I can journal and get to the gym early. At the end of the day, I don’t need to do all the extra little things. I just came here to #tellstories, and hopefully a month where I am able to be intentional will make that a priority. Wow. Are you April fooling? If you’re serious, I hope you’ll provide an occasional status report. Marisa I can relate to so much of what you are saying. It took me more than 12 months to take a daily vitamin on, yes, a “daily basis.” That was several years ago and it serves as a reminder to me that whether you make an intention and follow through, or not, time still passes. I cannot remember the last time I did not take my vitamin now, it would be weird like not brushing my teeth or something. Please let us know how you do on your journey! That’s such a perfect way to say it, Lisa! No matter what, time is passing, and I have to spend my time the right way. And I will keep you updated. I think I can keep it all up for a month, though not spending the spontaneous cash may kill me. I definitely have a lot the same problems myself: procrastination, laziness, binging and unhealthy foods. I try to work on one at a time, but I’m about as good as keeping that going as I am at physical juggling. I start focusing on the new ball and completely drop the one I thought I had in a good rhythm. Good luck and do your best! Those are some lofty goals (at least from where I sit) so I hope you achieve them. Thanks, Matt! And the thing that is making it super easy is that I only think in terms of one day. So, if I can meet all of those goals today, then I can definitely do it. And looking at each individual day rather than all of the future laid out in front of me, it’s so much easier. I 110% support and respect all of these decisions. I’ve had to give up wine. It makes me so sleepy and dehydrated. It’s like my eyeballs shrivel up into raisens. On the eating…I completely agree on the fast food. It so yummy but sooo bad. Why do burgers have to taste so damn good?!?! Allison Griffeth told me about an app that helps her menu plan. She said it has changed the way they eat, shop, cook. Basically it changed her life. I can’t remember what it’s called but will ask. Thanks, Stephanie! Burgers taste so good…and they are so accessible! I hate that. I’ll definitely have to look for that app. I’m one day down, and could use all the help I can get. I really get what you mean about being intentional. Life has sucked in a lot of ways the past few years for me and my husband, and I went through several solid months of depression, personally, and I’m finally starting to heal from a lot of it. Life isn’t necessarily easier, or better, but I’ve decided that this year I’m going to make things happen instead of just waiting to see what goes wrong. Because something will go wrong, and I might as well enjoy myself in the meantime, right? Best of luck with April. Hope you achieve great things (no matter how ‘small’ they are)! That’s so perfect! I’ve never thought about enjoying myself and not worrying about things going wrong. I love that. And I know what you mean about healing from depression. It’s hard, and it takes so much work to just make yourself feel like a real person again.